Written by Adam B. Kashlak on 26 January 2017 . In “The frequency of 'America' in America” - from the October 2016 issue of Significance - we considered the increasing frequency with which the words “America” and “American” have been spoken and written by the first 44 presidents of the United States, specifically during their State of the Union (SOTU) addresses. President Obama ended his tenure with over 1.0% of all SOTU words spoken being “America” or “American”. The analysis showed that, over the lifespan of the United States, there has been a steady and exponential increase in the usage of these words, and we predicted that the next president would achieve a frequency of "America" of between 1.0% and 1.5%. Written by Mark Liberman on 24 January 2017 . Before Donald Trump's inaugural speech on Friday, 20 January, I wondered whether he would turn the political world upside down by delivering a high-energy improvised riff in the style of his campaign rallies. But no — his speech was scripted and read verbatim as written, although it did feature several of the signature lines from his rallies, as well as the first use of the word "carnage" in a presidential inaugural. How wrong were the presidential polls and predictions? Written by Timothy Martyn Hill on 23 November 2016 . On 14 July 2016 the Republican presidential candidate Donald Trump was polling seven points ahead of his Democratic rival Hillary Clinton. A billionaire property developer who had never been elected to any office was beating the Secretary of State and former Senator for New York. If he could maintain those numbers, Trump would be in the White House by January 2017. As the campaign wore on, his support oscillated but never overtook Clinton for very long. Before dawn on polling day, 8 November, one modeller rated Trump’s chance of losing at over 99%. Written by Paul Whiteley on 11 November 2016 . 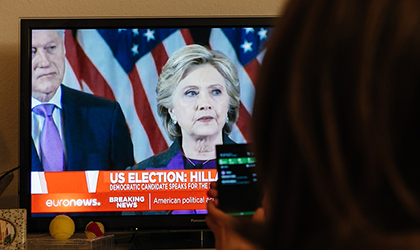 In the US presidential election, the final poll of polls compiled by Real Clear Politics predicted that Hillary Clinton would win 46.8% of the popular vote and Donald Trump 43.6%. In the end, Clinton won 47.7% and her rival won 47.5%. This small majority she had in the popular vote was reversed in the electoral college and she won 228 delegates to Trump’s 279 (figures exclude New Hampshire, Arizona and Michigan). So the last-minute polls were accurate in predicting Clinton’s vote but were off by 4% in the case of the Trump vote. What went wrong? Written by Timothy Martyn Hill on 02 November 2016 . On Tuesday, 8 November 2016, the United States will hold its 58th quadrennial presidential election. Many pundits believe, as they have done throughout the campaign, that Democratic candidate Hillary Clinton stands a better chance of winning than Republican nominee Donald Trump. However, a new ABC News/Washington Post poll puts Trump ahead – albeit only by a percentage point, which is well within the poll’s margin of error.